A slow start. I love Kevin Hart's stand-up, but this movie stalls until DJ arrives on the scene. However, once Dwayne appears, wow (as per his character and stature) he's a powerful force: confident, bright, and childlike. Kevin comes to life then as well. Of course, it's their interaction that generates the momentum of the film. That said, the script itself is no slouch. It's got mystery, a vague sketch of a plot (which is all it really needs), keep-you-guessing-ness, fun action and lots of comedy, and even some good old fashioned warm heart. Jason Bateman is perfectly cast utilizing his one or two moments of screen time to knock it out of the park. 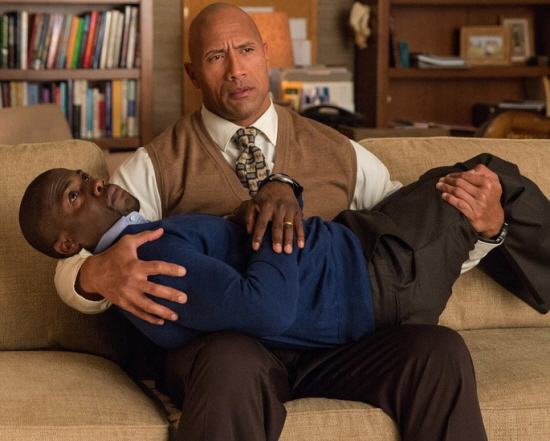 If you want a good time at the cinema, check out "Central Intelligence." There's even an anti-bullying message built in. And don't leave the theatre before the bloopers reel at the end. It had me laughing till I was crying as it revisits (among others) one of the funniest moments of the film: "Soul Gazing." A strong B+. Central Intelligence. Copyright © 2016. Starring Kevin Hart, Dwayne Johnson, Jason Bateman, Amy Ryan, Danielle Nicolet. Warner Bros.